Various types of economic illegalities as well as underground economic activities occur in all countries. In Cuba, however, public policies and structural economic forces have promoted these phenomena significantly. Indeed, Cuba appears to be awash with economic illegalities. Some of these are quickly apparent to the average visitor. Many Cuban citizens insist that almost everyone is involved in economic activities that are considered illegal by the state— though these often do not appear to be unethical to the perpetrators. One might say that there is a pervasive culture of illegality in the Cuban economy and society at this time. The causal forces at work in Cuba generating this behavior include some historical factors and other factors that are common to all countries. However, there are a number of specific forces resulting from the economic policies of the Government of Cuba that have produced and sustained the structural, monetary and institutional imbalances in the economy that in turn generate many of the illegal economic actions by citizens. Many illegal actions in fact are necessary for citizens as part of their personal and family survival strategies. The economic and social consequences of the illegalities are corrosive and damaging to Cuba and its people. However, to change current economic policies and structures in order to ameliorate the illegalities will be difficult. While on occasion the Government of Cuba seems to be aware of the phenomenon, it has so far confined its policy response to policing actions aimed at suppressing it, but not dealing with the root causes. The objectives of this essay are to analyze the character of economic illegalities in Cuba at this time, the forces that produce them, their consequences, and the policies necessary to reduce them. The essay begins with a theoretical analysis of the nature of informal economy, the underground economy, and economic illegalities in general and with application to the Cuban case. In the next section, the character and the dimension of economic illegalities practiced in Cuba are presented. Following this is an examination of the causal forces that produce this behavior. The economic and social consequences of the culture of illegalities are examined in the next section. The range of institutional changes and policy reforms that would be necessary to reverse this phenomenon and to strengthen a culture of economic legality in which ethical economic behavior is in harmony with legal economic behavior are then discussed. Following this, the current political environment that obstructs an approach to this problem is sketched briefly. Finally, the argument is summarized and the main conclusions are outlined. There is relatively little written so far on illegal economic activities in Cuba, though their existence and magnitude is well known. Most casual observers or visitors to Cuba are introduced quickly to such activities by the ubiquitous vendors of cigars and unlicensed taxi-drivers, for example. The underground economy is so obvious that it has been observed and explored by journalists that have visited Cuba, even for short periods. Vanessa Bauzá, writing in The Houston Chronicle (2001) described an illegal video rental enterprise of the sort that exists all over Cuba. Gary Marx of The Chicago Tribune (2003) unearthed information on the illegal lottery that flourishes in Cuba. Ken Gray of The Ottawa Citizen (2004) referred to flourishing black markets, illegal intermediaries and “finders fees.” Mark Frank, writing in The Financial Times (2004b), observed the underground economy in rural Cuba. In a feature article for The Toronto Globe and Mail (2005), Marina Jiménez explored the underground economy in general. The most thorough analysis of illegal and underground economic activities is that of Jorge Pérez-López (1995) in Cuba’s Second Economy. This study focuses on the non-state sector (self-employment and illegal activities) up until 1994 and is the bench mark study for this period. Pérez-López also examined the phenomenon of corruption generally and its likely future evolution and control under a process of economic and political transition (2004). 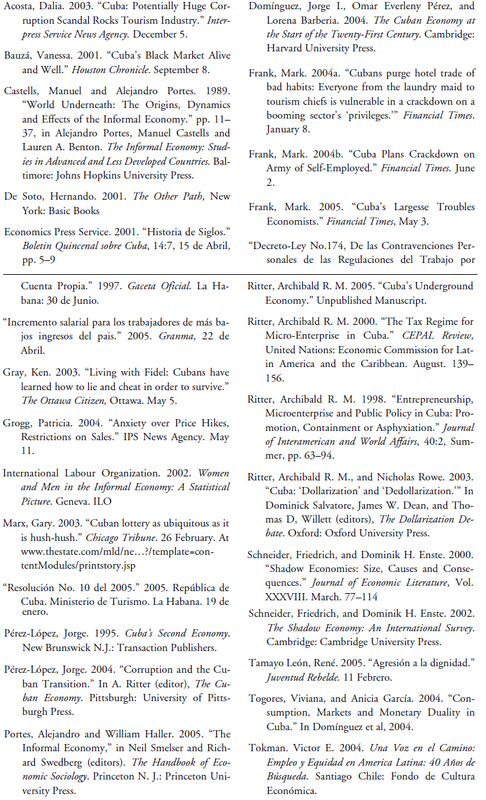 A recent work by A. Ritter (2005) analyzed the functioning and implications of underground enterprises that produced legal goods and services in Cuba. Ted Henken analyzed the illegal activities surrounding the paladares, taxi, and bed and breakfast sector self-employment activities in Havana as part of his doctoral thesis. Otherwise, there seems to be relatively little academic analysis of the economic illegalities that are the focus of this essay. The terms “formal economy,” “informal economy,” “underground economy,” “criminal economy,” and “economic illegalities,” have been defined in a variety of ways in different contexts and by different authors. The term “informal economy” was introduced initially in 1972 by the International Labour Organization in the context of Kenya, and was further elaborated in the Latin American context by Victor Tokman (2004) and De Soto (1989), among others. More recent analyses, by Portes and Haller (2005), synthesize a variety of strains of thought regarding informality. The definitions put forward by Castells and Portes in 1989 have had considerable influence on our thinking regarding formality, informality and the criminal economy. They categorized economic activities according to the legality of the goods produced and of the processes of production and distribution, and arrived at the categories summarized in Table 1. This is a reasonable typology of economic activities and could be elaborated considerably. One additional element that perhaps should be distinguished is household-based economic activity, or goods and services produced at home for home consumption, and not marketed to others. However, this schema is not appropriate for the current Cuban case. This is because a true “informal economy” does not exist. Small-scale enterprises are either “formalized” through their incorporation into rigorous tax and regulatory regimes, or else they are prohibited and “criminalized” and forced out of existence or into the underground economy. Moreover, these three categories can not accommodate the complex and varied forms of economic illegalities that occur throughout the Cuban economy. For these reasons, a different theoretical framework is utilized in this essay. 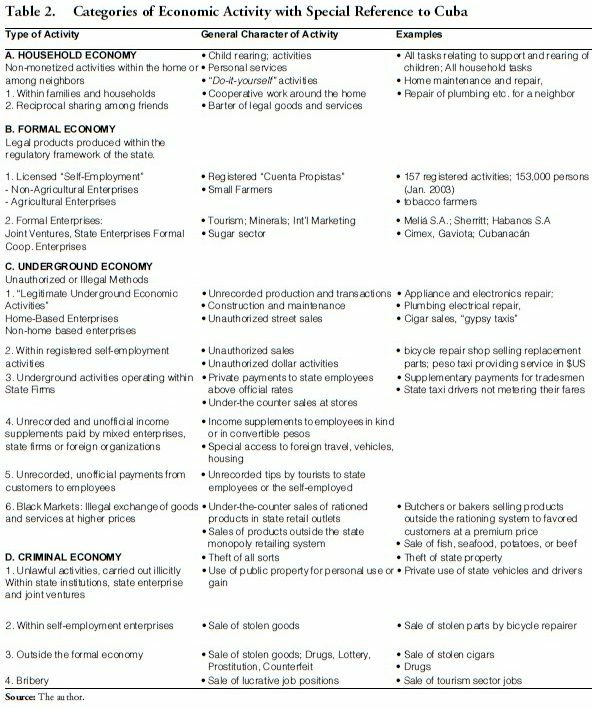 In order to fit the institutional character of the Cuban economy, a custom-designed set of institutional categories or definitions is presented in Table 2. The four main categories are: Household Economy, Formal Economy, Underground Economy, and Criminal Economy. These categories grow out of the Castells- Portes definitions of Table 1, but are modified in the light of the analyses and insights of Schneider and Enste (2002), the ILO (2002), and Pérez-López (1995). The Household Economy, Category A, is similar to the ILO (2002) concept of “Reproductive” or “Care Economy,” and includes all non-marketized production and exchange of goods and services within the home and between friends and neighbors. 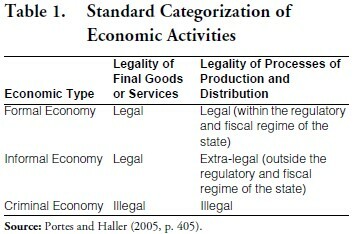 The “Formal Economy,” Category B, includes state enterprises, mixed enterprises (with joint foreign multinational and state ownership), and cooperative enterprises. The formal economy also includes the licensed self-employed, as they operate within a tight framework of licensing, size limitations, health and safety regulations, employment regulations, environmental regulations in some cases, and a rigorous fiscal regime. These two varieties of economic enterprise and activity are not the subject of this essay. The analysis focuses instead on the Underground Economy, Category C, and the Criminal Economy, Category D.
6. “Black markets” or illegal exchange of goods and services. Legitimate underground economic activities involve the production and exchange of legal goods and services although they are outside state control. Though tolerated elsewhere, in Cuba such unauthorized activities are considered criminal. A second variety of activity would be the private or semi-private enterprises operated by some employees within the state sector, that require additional payments from citizens for their services. Some employees of mixed enterprises receive additional dollar incomes “under the table.” Some employees of state firms and institutions use public property for private activities and may receive particular benefits in terms of access to foreign travel and the per diems this generates. The criminal economy, Category D, refers to those economic activities that produce illegal goods and services and do so in clandestine circumstances out of the regulatory and fiscal purview of the state. Illicit drug manufacture and sales, prostitution, trade in endangered species, gambling in some jurisdictions, the sales of some types of firearms or explosives, smuggling, theft, and the sale of stolen property are cases in point. Bribery and overt corruption would also be part of the criminal economy. Many types of economic illegalities occur in Cuba. Below is list of some of these that are known to the author.1 The notation beside each example refers to the type of illegality as categorized in Table 2. This list could be extended indefinitely. It is difficult to know how significant these types of illegalities may be. Cuban citizens, as noted, often assert that everyone is involved. However, the scale of the illegalities appears to be enormous. Many types of goods are sold “door to door” by vendors in middle class areas. It is often stated that everything imaginable is available on the black market, ostensibly from pilferage from the state sector. A glimpse of the magnitude of the illegal underground economy may be obtained from a number of examples. One report indicated that in three of the 15 Municipalities in Havana, police and customs officials raided 150 clandestine cigar-making operations, which were then shut down. 11,935 boxes of cigars were confiscated (www.Cubanet.org 6/1/04). If there were 150 illicit cigar operations in three of the 15 Havana Municipalities, it is likely that there are thousands across the country, because of the widely known skills, the low barriers to entry into the activity, and its profitability. Recent restrictions on the export of cigars without proper paperwork and purchase validation has perhaps impeded but certainly not blocked the illegal production and/or sale of cigars. This is a billion-dollar business, where millions flow daily in a poor country of people struggling to survive. Everyone finds some way to get unearned income and a few people get greedy. Just like in many other Third World countries, people often pay to work in the industry and then kickback a proportion of what they earn to their superiors. I could give you hundreds of examples. How high up these little mafias go, and if the problem is related to the Cubanacán scandal, is anyone’s guess (Frank 2004). This seems to have been corroborated in early 2004 when 15 higher officials of Cubanacán4 were dismissed from their jobs, as was the Tourism Minister, Ibrahim Ferradaz, and some lower level employees a while later (Frank, 2004.) On February 19, 2005, Resolution 10 was enacted by the Ministry of Tourism, defining a code of conduct for the workers in the sector as well as higher-level management officials. The causal forces underlying the pervasive illegal activities are complex but are rooted mainly in the economic policies that have generated an economic environment in which citizens find it necessary for their survival to act outside the letter and spirit of the law. It is also important to bear in mind that economic illegalities of various sorts are common in most countries, and there are some forces at work in Cuba that are common to most other countries as well. It is possible that part of the disregard for economic authority on the part of Cuban citizens has deep Colonial and pre-Revolutionary roots. From earliest Colonial times, Cubans broke the enforced bilateral trade relationship with Spain. Contraband trade with the French, British and later the United States, as well as with pirates in defiance of the Spanish Colonial authorities and the naval command at Havana, was not uncommon.5 Indeed, according to censuses of the time, Bayamo in Eastern Cuba was almost as populous and developed a city as Havana and Santiago, but its development was based on illegal trade, supplying meat and leather to pirates and corsairs (Economics Press Service, 2001:5). By the 1950s, while Cuba had developed a diversified range of large modern corporate business, large numbers of small-scale cottage industries continued to exist in many areas of the economy. This was an authentic “informal economy,” of the sort defined by the ILO and by Portes and Castells: producing legal goods and services and tolerated by the state even though the sector was outside the state’s regulatory framework. Some of these attracted the attention of the 1951 IBRD (Truslow) Mission to Cuba. These small enterprises evaded taxes, paid lower wages than the large firms, were not unionized, avoided social benefit payments, and were generally outside the regulatory framework of the state. The large enterprises complained to the IBRD Mission of unfair competition from these small producers. However, the IBRD did not recommend their elimination, recognizing the economic and social benefits they generated. Instead, the IBRD urged the large-scale firms to operate more efficiently so as to be competitive with the small firms. There was probably a considerable degree of continuity between the pre-Revolutionary period regarding underground economic activities and their continuing operation, as well as a culture of illegal underground enterprise after 1959. People already functioning “in the shadows” in 1958 were in a reasonable position to continue to operate underground after 1959. A second factor promoting economic illegalities is the essential character and functioning of the central planning system, adopted in 1961–1963. The rationing system, implemented initially in 1961, was designed to provide everyone with a basic supply of foodstuffs, clothing, and household products in order to achieve a minimum level of equality of consumption and real income. This was to be achieved by replacing individual (or family) choice, expressed through markets, with an allotment of basic goods available at prices that were low relative to the average monthly income. Because everyone received essentially the same rations, many people would sell the rationed items they did not want or trade them for other products they did want. In this way, the rationing system converted virtually everyone into a mini-capitalist, searching for opportunities to sell and to buy. Related to the above phenomenon was amiguismo or sociolismo, that is “friend-ism” or “partner- ism.” These terms refer to the reciprocal exchange of favors by individuals. Any person with control over resources could exchange access to those resources for some current or future personal material benefit. Complex networks of reciprocal obligations thus became an important part of the functioning of the economy. Daily life involved maintaining the personal relationships necessary to ensure access to necessary goods and services, through unofficial channels or through the official channels unofficially. The character of the central planning system itself also promoted clandestine economic activities.6 In a perfectly functioning central planning system, enterprise managers would have little to do besides obeying and implementing orders. But because the planning system cannot work perfectly, especially in the context of economic turbulence with major disruptions in flows of supplies, enterprise managers often must take initiatives in resolving unforeseen problems through improvisation outside the formal central planning system. To obtain required inputs they often must negotiate with other enterprises, with superior officials, or with superiors or inferiors in other sectors or Ministries. In these negotiation processes, political argumentation, political or Party amiguismo as well as monetary payments have been central, resulting in highly politicized economic management. This also promoted the illegal and extra-legal exchange of goods. Continuing suppressed inflation arising from increases in the money supply while prices remained fixed created a situation of excess demand and generalized shortage. This meant that anyone with privileged access to a product at an official price could resell it at a higher market-determined price. This created a strong incentive for “rent-seeking,” or making a profit from arbitrage between the fixed price state sector and the market determined prices. There appears to be a “tragedy of the commons” or a “common property problem” at work with respect to state property. A general attitude appears to be that state property belongs to no one and to everyone, so that if one person does not help himself to it, someone else will instead. Public property thus seems to be treated as if it were firewood in a public forest, fish in the seas, or wild blueberries in the mountains, belonging to no one in particular. It is “up for grabs” to whoever needs it and is in a position to take it. Similarly, public property such as vehicles accompanying an official position, are readily used for personal purposes with few qualms of conscience. In the words of Juan Clark, “The majority of people believe that stealing from the state is not a crime” (cited in Pérez- López, 1995, p. 99). The standard for this type of attitude and behavior may be the Communist Party of Cuba and President Castro, who are able to use all state property for partisan political purposes. There seems to be only an ambiguous distinction drawn between the property of the Communist Party or President Castro, on the one hand, and public property generally on the other. A general reason for illegal economic activities is the coexistence of the two economies, the old peso economy with rationed products at very low prices, and the new economy with convertible pesos (previously dollars) and to some extent, international or market determined prices. The gap in prices between these two economies is enormous, creating a large opportunity for arbitrage, in a “black market” in which prices are determined by supply and demand. An example of the price gap between the two economies will illustrate the scope for arbitrage. The “dollar stores” in particular are expensive, charging prices that are literally hundreds of times higher the prices for the rationed products. For example, the price of sugar with the ration book is 0.15 old pesos per pound. In comparison with this, a pound of sugar is 1.50 convertible pesos or 39.00 old pesos (at the exchange rate relevant for Cuban citizens, that is 1.00 convertible peso = 26 old pesos) in the “dollar stores.” This is 260 times higher that the ration system price. Every product available at an “old peso” price through the rationing system can be resold in the black market at a higher price. In summary, the gap between the low prices in the rationed product sector and the high dollar store prices create large potential profits for arbitrage buying and selling in an illicit “black market.” The “black market” also includes numerous other products that are pilfered from the state sector as well, of course. Policy limitations on micro-enterprise promote economic illegalities. Restrictive licensing means that potential legal micro-enterprises are pushed into the underground economy. Legislation in October 2004 banning the issue of new licenses for some 40 types of micro-enterprise will further intensify this effect. The tough regulatory regime for micro-enterprise also makes their lives difficult and leads some of those who can to underground (see Decreto Ley 174, 1997). Tough regulations regarding the inputs that can be used and where they can be purchased push some micro-enterprises into illegal acquisition of inputs. Restrictions on employment have a similar effect. Basically, the more complex are the regulations governing the conduct of particular economic activities, the greater the scope for illegal actions. For example, the regulations and tax provisions affecting self-employment activities, especially restaurants and bed and breakfast operations, are exceedingly complex, designed to limit size and incomes, and to force the enterprises to purchase their inputs in the appropriate places. In consequence there are frequent violations of those rules that are thought to be unreasonable by the self-employed. Heavy taxation also leads some micro-enterprises to try to evade taxes in various ways (Ritter, 2000). The result of all of this is that large numbers of enterprises that would otherwise operate legally above ground are forced into clandestinity. The range of enterprises operating in this way is surprisingly diverse. Besides a range of personal service activities and retailing, there is a full range of automotive services, construction trades, mechanical services, gastronomic services and food preparation. The range of manufacturing activities in the underground economy includes shoemakers, mattress making, furniture making, wood-working, rum making, candy making, beer brewing, ice cream making, soft drink bottling, cigar and cigarette manufacture, foundry activities among others. Heavy taxation and regulations such as labor laws, minimum wage legislation, and health and safety standards also serve to promote underground economic activities in most other countries as well (Schneider and Enste, 2002.). What is different with respect to the Cuban case is the onerousness of the taxation levels, the rigor of the regulatory regime, and the limited licensing of some micro-enterprise activities. The most powerful force promoting economic illegalities of many sorts is necessity. The general economic policy framework produces a structure of incentives and overall situation facing Cuban citizens that requires that they undertake numerous ostensibly illegal economic actions in order to survive. The central reason for this is that people earn moneda nacional or “old pesos,” but their earnings are insufficient to purchase the basic foodstuffs—not to mention everything else—that they require for survival. This means that people must find additional sources of income in “old pesos” or convertible pesos (previously U.S. dollars) to permit their survival. Cuban citizens often express the situation by saying that their official monthly wage or salary will buy basic foodstuffs from the rationing system and other sources that are sufficient for only about 10 to 14 days of the month. Purchases for the rest of the month must made with funds from other sources. A study by L. Lam for Havana in 2002 estimated that the foodstuffs available through the rationing system provided adequately for children age 0 to 6 years in terms of calories and protein, though not fat. However, the age group from 14 to 65 years received only 43.1% of the calories, 32.1% of the protein, and 12.9% of the fats recommended by Cuba’s National Institute for Nutrition and Food. Similarly, those over 65 years of age received 61.8%, 55.4%, and 17.2%, respectively, for the three food components (Togores and García, 2004, p. 260). This means that it is necessary to find other sources of foodstuffs, from the mercados agropecuarios, the dollar stores, the state vegetable markets, the black market, or from household production. The first four of these sources are expensive, so that Cubans are hard pressed to make up the food deficits from the rationing system. In fact, the average monthly per capita income in 1998 was 116 old pesos. Clearly according to these estimates, state sector incomes were insufficient for survival. This meant that virtually all Cubans needed additional sources of income, preferably in dollars or now in convertible pesos. To elaborate on this depiction of the general economic situation of the citizens of Cuba in the Special Period, consider their average incomes and the availability of the rationed goods and services. The average wage or salary of Cuban citizens in 1999 was 223 pesos per month in the socialist economy (CEPAL 2000A, figure A.1), rising to 282 by April 2005 (Granma, 22 de Abril de 2005). At the official exchange rate of relevance to Cuban citizens over the 2003 to 2005 period, namely 26–27 pesos per U.S. dollar, this would amount to about $US 9.00. Doctors, teachers, engineers, and professors earned in the range of 200 to 450 pesos per month and pensioners received 104 pesos per month (Espinosa Chepe, 2001). The state subsidy covering or reducing costs in many areas of life (housing, electricity, education, health, etc.) reduces the typical required expenditures for Cubans. However, official incomes in the peso economy are still unable to cover the difference especially when many essential products are available only in U.S. dollars or convertible pesos. Virtually all citizens attest to the inadequacy of the peso income to meet daily living requirements. The inadequacy of peso incomes was confirmed in April 2005 when President Castro announced major wage and pension increases for lower income citizens. Apparently, this was in response to a report from a group of economists who were charged with examining the growing poverty in Cuba (Frank, 3 May 2005). The minimum wage was increased from 100 to 225 pesos per month, and the minimum pension from 55 pesos to 150 pesos (Granma, 22 de abril de 2005). As a result of these changes, the average income—from state sector activity—rose from 282 to 312 pesos per month (ibid.). However, these increases do not appear significant in convertible pesos at the exchange rate relevant for Cuban citizens (26 pesos per convertible peso in 2005). This is because the increased incomes will have to be spent on non-rationed products. Products from the hard currency (former dollar) stores (Tiendas para Recaudación de Divisas) require convertible pesos, and include tax levels of 140%. Vegetables from the Mercados Agropecuarios and the state vegetable markets are also market-determined or close to it. Black market prices are also market determined and relatively high. The purchasing power of the income increases for pensioners and those on the minimum wage therefore does not appear to be particularly significant. However, people in fact survived. They purchased not only their required food, but other daily requirements as well as household items, including furniture and electronic devices, clothing, tobacco products, beverages, etc. People were able to survive because they had other sources of income besides the incomes earned from the official wage and salary system. There are a number of ways that people can acquire additional incomes. First, some receive remittances from family members or friends outside Cuba. In aggregate, the remittances are significant, amounting to around $US 700 million by 2000 and perhaps around $US 1,000 million (or about $US 90.00 per person) in the first years of the 2000s (Eckstein, 2004: 326). Second, some Cubans acquire convertible pesos (formerly U.S. dollars) from foreign travel for governmental, business, or academic purposes. Third, income supplements paid by foreign enterprises or international organizations are technically illegal but presumably are known to the Cuban government and tolerated. Fourth, some 140,000 Cubans earn incomes from self-employment. Probably most of these earn rather modest incomes, especially if they provide services to other Cuban citizens. A large number of individuals formally or informally work as cuenta propistas. This spreads any higher incomes that the cuenta propistas might earn around somewhat. Fifth, another source of additional income for a few people is work abroad in an officially sanctioned capacity, such as working in Venezuela. Some artists and musicians also have the possibility of traveling abroad more easily and vending their art and their services outside the country. Sixth, many Cuban citizens also earned tips from their work in the tourist sector or activities catering to tourists and other foreigners.7 Seventh, income supplements in kind or in cash (convertible pesos) have also been provided to considerable numbers of workers in key sectors of the economy. But what happens to those citizens lacking access to any of these sources of supplementary income and unable to emigrate? Their economic situation has been desperate. As seen above, their very survival could be in jeopardy. Necessity is the primordial force pushing citizens into economic illegalities of numerous sorts or into the underground economy. The economic illegalities that are practiced in Cuba have a range of consequences. Some of these are perhaps benign and even useful, but others are socially and economically noxious. The consequences vary depending on the specific character of the illegality, and are summarized briefly in Table 4. 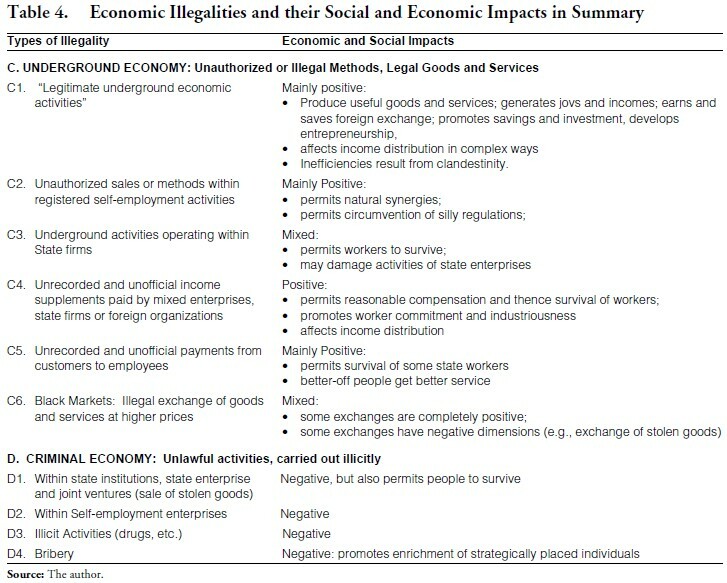 The otherwise legitimate underground enterprises that produce legal goods and services have a mix of impacts (Ritter, 2005). Such enterprises consist of low-income people producing valuable goods and services for other low-income citizens, usually those goods and services that are provided ineffectively by the state enterprise sector. These enterprises generate jobs and incomes for the entrepreneurs and the workers. The entrepreneurs save and invest. They earn hard foreign exchange from the products sold to tourists and save foreign exchange by relying heavily on recycled and domestically available inputs. They are also valuable “schools of entrepreneurship.” The owners of these enterprises work hard and utilize their resources as efficiently and carefully as possible under the circumstances of clandestinity. These firms operate with no state support but instead with official harassment. The negative aspects of the enterprises arise from their enforced clandestinity. They evade taxes. They may also be inefficient due to their small size and the “costs of clandestinity” and therefore they may waste a proportion of the entrepreneurial energies of their owners. They also may rely on inputs pilfered from the state sector, partly because other reasonable sources are unavailable. At the other end of the spectrum is theft from state enterprises and institutions and the use of public property for personal purposes. While these activities may help some people survive, there are noxious effects of this sort of lawlessness. First, theft damages the enterprises and institutions in which it occurs, as their capacity to provide the goods and services they are intended to provide to the general public is impaired. Second, theft worsens income distribution in that those who do not have access to it have lower effective incomes than those who do, but at the same time their access to lower priced state sources of goods and services is reduced. The income distribution effect of the use of state property for personal purposes may be less visibly noxious but damages income distribution considerably because those with privileged access gain at the ultimate expense of the broader society. Corrupt practices, such as the taking of bribes or the selling of employment positions, are also particularly odious. In this case, strategically placed individuals are able to use their roles or positions of privilege and trust. Those who are able to pay bribes or purchase their jobs also gain privileged access to scarce goods and services, again damaging other people’s access and thus harming the broader society. Black markets may be either welfare enhancing or welfare diminishing. If the black market exchange between a willing buyer and seller does not involve stolen property but only the re-circulation of rationed goods, for example, then it is of benefit to both seller and buyer. As a case in point, the unofficial under-the-table payments accompanying a permuta or the exchange of housing of unequal value, can result in both buyer and seller being better off, as indicated by their willingness to undertake the transaction. In this case, the unofficial “black market” type of payment will have a strong positive effect on economic welfare. On the other hand, a good deal of black market merchandise is stolen from the state sector. Obviously, this is a negative phenomenon. Even if both buyer and seller gain, they are doing so at someone else’s expense. Finally, stealing from the state breeds attitudes and cultures of lawlessness that damage trust and the ethical foundations of the economy and society. The practice of economic illegalities could escalate and become a sort of undeclared civil war among citizens for spoils from the system. The practice of illegalities could accelerate and become a set of interacting vicious circles that ultimately could deform and paralyze the economy and society. In view of the corrosive and debilitating effects of pervasive illegalities and the widespread culture of petty corruption, ultimately they should be reduced if not eliminated. What measures might be workable and effective in this regard? The current Government periodically has campaigns of a punitive and exhortatory character. However, these are seldom effective for more than a short period of time. To deal with such the culture of petty corruption requires deeper cutting policy measures. One possible approach towards the reduction of economic illegalities might be to simply shut down the legal self-employment sector. This would eliminate any illegal actions that the legal microenterprises were engaged in. However, the downside of this is that some such activities would go underground and their activities would be totally illegal from an official perspective. Those formerly self-employed would also have a strong incentive to engage in a variety of other illegal activities as well, in order to make ends meet. Actions such as the elimination of 40 categories of self-employment for the issue of new licenses in October 2004, and the removal of some 2000 licenses from existing microenterprises in mid-June 2005 (Frank, 19 June 2005), are unlikely to lead to net reductions in illegal activities. A second possible approach, and one used frequently by the Government of Cuba, is punishment for the perpetrators of illegal actions. This requires monitoring and policing of many types of activities. A major role for the police is the stopping of anyone traveling by foot, bicycle, or car on the street with large packages or pack sacks, in order to apprehend anyone engaged in the transport of black marketed products. This is a major task for the police and one frequently can observe individuals being stopped for questioning by the police in cities such as Havana. However, the police themselves may overlook such possible or actual infractions, out of friendship for the perpetrator, empathy for the situation that they find themselves in, or possibly a pay-off of some sort.8 Infractions may be punished by prohibitions of the relevant activities, but this may only push them underground. To prevent infractions, inspectors are required to police the legal self-employment activities. However, it is also reported that in some cases, the inspectors have become avaricious, and require payoffs for infractions, real, imagined or fabricated. In other cases, the inspectors seem to be somewhat less officious in enforcing the letter of the regulations relevant for the micro-enterprises. In other situations, the government uses some sort of a pretext to undertake house to house searches for illegal activities. In January of 2003, for example, a campaign against drugs was used to search numerous homes and to penalize any illegal underground economic activities encountered. The impact of this was to lead to a cessation of some underground economic activities until the pressure was off. They then resumed production. The recent legislation prohibiting tourist sector workers from receiving tips personally but having to forward any such payments to their superiors for redistribution, may lead to a whole new area of illegalities (Resolución No. 10, 2005). Presumably a new set of monitors would have to be created to enforce this prohibition. But the addition of such “tip-police” would also create a new layer of corruptible officials, as in the case of the inspectors of the paladares and bed and breakfast operations. Part of the task of monitoring the people’s activities in order to prevent illegalities is passed on to the Comités para la Defensa de la Revolución (CDRs), or the neighborhood monitoring committees. In some areas, the CDRs may operate effectively to prevent illegal economic activities. However, the local officials of the CDRs also have to acquire additional income to survive. They themselves are likely to be involved in various activities that are illegal, and therefore they may not be excessively diligent in prosecuting or exposing their neighbors who are doing likewise. Or they may acquire a small share of the benefits of such illegal activities so that they are happy to overlook and ignore them. In other contexts, security guards are used to try to prevent theft or other illegal activities. However, these individuals also would like to survive, so that they also may be keen to look the other way when an infraction or theft is occurring in order to obtain a payment. They may also pilfer articles or materials from their place of work or obtain a payment from others who may be doing the pilfering. To sum up, as long as the basic conditions of people’s lives require them to acquire additional income to survive, the various layers of inspectors, monitors, security guards, and CDR officials constitute corruptible layers in the system. Their true effectiveness in enforcing the regulations and preventing illegalities of various sorts is limited. A further measure to reduce economic illegalities is exhortation through speeches, and statements, editorials, or articles in the media. However, it is not clear how much attention people give to the presentations of President Castro or to official exhortations. The experience of the Revolutionary Offensive, when Castro, his key Ministers, the media, and all the institutions of society preached the New Man ideology without success, suggests that exhortation would have but limited impact on people’s behavior if it ran counter to the family survival imperative. Basic approaches will be necessary in order to reduce economic illegalities. First, as argued earlier, the dual monetary and exchange rate systems generate primordial economic forces that motivate people to undertake various types of illegalities. As Cuban citizens all know and often repeat, one earns “old” socialist economy pesos at one’s normal work but one must have convertible pesos (formerly U.S. dollars) for the purchases required for basic economic survival. As long as wages and salaries in “old” pesos fall far short of what is required for survival, people will continue to find ways, often illegal, to acquire additional incomes. The government has not yet begun to focus on the problem of unifying the monetary and exchange rate systems. Unifying the dual economy will be a difficult task, requiring complete realignments of internal wage and salary structures on the one hand, and costs and prices on the other (Ritter and Rowe, 2003). A second fundamental means of reducing illegal economic activities would be to revamp the regulatory, fiscal, and policy environment within which legal microenterprises operate in order to permit them to “thrive in legality.” An appropriate approach to licensing would be to permit licensing for all microenterprises that want to establish themselves, and that paid taxes and respected reasonable regulations. There is a difficulty with this, however, namely the credibility of government policy. With a changed government or an authentic and credible change in policy towards micro-enterprise, the result in time would be that micro-enterprises would come above ground and into the official tax and regulatory system. Additionally, the government could simplify the dense rules and regulations and establish a reasonable taxation system so that the incentive to remain underground is diminished. It would also be desirable to establish normal sources of inputs for the microenterprises, besides the high priced former-dollar stores. This would reduce and perhaps eliminate the tendency of some microenterprises to resort to illegal sources of inputs. Reducing the regulatory burden and simplifying bureaucratic requirements would also reduce the discretionary powers wielded by officials and inspectors of all types. This would reduce the possibility of abuse of discretionary powers by such individuals. Thirdly, a more difficult issue relates to state property in general. In Cuba, as was also the case in Eastern Europe, a clear distinction between the public use of public property and the private use of public property has not been maintained. The result is widespread pilferage and the use public property for private purposes. To the extent that people view the economic system as hostile and one that makes it impossible for them to survive legally, theft may be viewed as legitimate, or necessary if illegitimate. This attitude does not appear to be prevalent in very small enterprise in Cuba as any employees see the immediate results of their actions as damaging someone else and as the owners can monitor the enterprise closely. As argued above, the pervasiveness of state property itself helps promote a culture of pilferage and other illegalities, through the “tragedy of the commons” phenomenon. To deal with this deeply rooted behavior will not be easy. Reducing the role of the state in running economic enterprises may reduce much of the scope for the pilfering of public property. Changing behavior at the highest political level so that there is a strong demonstration effect regarding public use of public property would also help. A strong economic recovery and a broadly based improvement in real incomes or living standards, so that necessity did not compel people into illegalities for their material survival, would also be of major benefit for reducing such illegalities. In the longer term, the task of reducing economic illegalities will be one of changing the “economic culture” that has evolved. The deeply ingrained behavior of pilferage, extraction of personal benefits from positions of power and responsibility, and use of public property for personal gain will be changed only with changes in the “objective conditions” that generate it. It is unlikely that public policies will change under the current Government to reduce the scope and intensity of the illegalities that are ubiquitous at present. Activity in most areas of public policy has been paralyzed as of the latter 1990s. Indeed, some aspects of policy may exacerbate the situation further. Political leadership at the highest level may not realize the breadth and depth of the economic illegalities and the underground economy. However, there seems to be some awareness of the problem in view of the difficulties in the tourism and the rather draconian solution applied to the employees in that sector (Resolución No. 10, 2005). To the extent to which the issue may be known, it would appear that exhortation, policing and punishment are the methods used to deal with the phenomenon. These methods may work to some extend and for a while. However, their effects are likely to be transient if the underlying forces that generate the pervasive economic illegalities are not addressed. The unification of the monetary and exchange rate dualism that creates the chasm between (old) peso economy earnings and the convertible peso (formerly U.S. dollars) requirements for survival is not “in the wind” at this time. Instead, the recent appreciation of the convertible peso vis-a-vis foreign currencies prolongs and intensifies this dualism. Instead of liberalizing licensing, reducing the density of the regulatory regime, and establishing a reasonable tax regime, the reverse is in fact occurring. The result is that fewer legal self-employment micro-enterprises will exist, while the underground economy expands. The increasing density of regulations also promotes intensifying evasions. With respect to changing popular perceptions of the sanctity of public property, it is questionable whether or not current approaches are serious and are likely to be effective. As long as the leadership, the Party and higher officials use state property for personal purposes, it will be difficult to persuade citizens not to do so as well. Finally, economic recovery, increased real wages in the (old) peso economy, and an authentic improvement of living standards would reduce the incentive of people to pilfer state property and undertake other types of illegality. While there has been some economic recovery, and while living standards have improved somewhat from the dark days of 1992–1994, relative material hardship continues for many—and probably the majority. It is unlikely that many people could survive on their peso incomes alone without additional sources of income. Until this situation changes, the economic illegalities will continue. It thus appears unlikely that the scope and intensity of the economic illegalities analyzed here will diminish as long as the current Government is in power— or until it changes some of its fundamental approaches to public policy and institutional structures. Pervasive economic illegalities of many varieties characterize day-to-day life in Cuba and the functioning of the Cuban economy. The causes of the broad scope and density of the illegalities are complex and include pre-Revolutionary roots, the nature of the central planning system, the “common property resource” phenomenon, unreasonable restrictions on self-employment, and monetary/exchange rate/structural dualism and the arbitrage this promotes. But the most important cause is popular necessity. As part of their family survival strategies in the context of a dysfunctional economic system, people resort to actions that are illegal in order to make ends meet. The consequences of the various types of illegality are complex and mixed. Those activities that are truly criminal in character are indeed socially and economically noxious. Widespread low-level pilferage from the enterprises and institutions is also noxious though it assists in helping people “make ends meet.” Other types of illegalities such as the payment of income supplements in cash or in kind by mixed enterprises or international organizations are largely benign. Unlicensed (and thence illegal) selfemployment has mixed but mainly positive consequences. 3. reducing the all-encompassing role of the state so as to reduce the common property resource phenomenon, thereby reducing the inclination to pilfer. Achieving real improvements in living standards so that people’s survival imperatives no longer require illegal actions is also necessary. Unfortunately, these economic reforms and a return to prosperity are some distance away. 1. The first such incident ever seen by the author was in 1968, when customers could avoid very long queues for tickets to permit immediate access to the Coppelia ice cream store on La Rampa with a small bribe to the person distributing the tickets. 2. The article in Juventud Rebelde, concerned mainly with the ecological implications of the phenomenon, also estimates that the annual income of a wood vendor was 39,000 pesos and that of a charcoal producer/vendor was 65,000 pesos, but these seem exaggerated. Could the state nationalize these activities and operate them effectively? Only with armies of bureaucrats, and police to control such a decentralized activity in the far flung regions of the country. 3. The shutting down of about half the sugar mills will create an additional difficulty in the towns affected, as supplies of cooking oil are no longer available to citizens informally. 4. Cubanacán is a state conglomerate enterprise that includes 51 hotels, 52 restaurants and cafeterias, a chain store with about 300 outlets, two marinas, a travel agency, a car rental and taxi service, a convention centre and 15 entertainment centres. 5. Cuba’s first major work of literature, Espejo de Paciencia by Silvestre de Balboa y Troya de Quesada in 1608 deals with a pirate who ravaged the coasts of Cuba kidnapping a bishop. 6. See Pérez-López (1994, pp.17–18). 7. However, as of January 19, 2005, Resolution No. 10 of the Ministry of Tourism prohibited the receipt of tips by tourism sector workers from foreigners. The measure also sought to limit the contact between foreigners and Cuban citizens, “to refrain from disseminating, propagating or emitting any views detrimental to the prestige of the country, Cuban institutions, work collective or other workers,” and to be discrete and rational in the transmission of information, among other things (Resolución No. 10, 2005). All tips actually received by tourist sector workers are to be turned over to their managers or chiefs for subsequent distribution. This regulation may be difficult or impossible to enforce. It will likely push more people into a new zone of illegalities. To the extent that it can be enforced, it may reduce the incentives for tourism workers to provide good service. 8. The author observed one unlicensed taxi driver, who had a permanent taxi stop at a major intersection, converse with the police, who were obviously his friends, but who were supposed to enforce the prohibition against his activity.